At the end of last year’s spring game, there was a clear winner as to who should be featured on the annual Hail Varsity yearbook cover. That, of course, was the receiving corps. Accompanied by the headline ‘We Shall Receive,' Jordan Westerkamp, Cethan Carter, Brandon Reilly, Alonzo Moore, De’Mornay Pierson-El and Stanley Morgan all stood in uniform. Four of them were seniors on the brink of their final season with Nebraska. One year later, the Huskers now have to find a way to replace them. Nebraska isn’t without some experience at wide receiver with the return of Pierson-El and Morgan. Tight end is where the bigger questions lie, but there’s promise among both the scholarship and non-scholarship athletes. 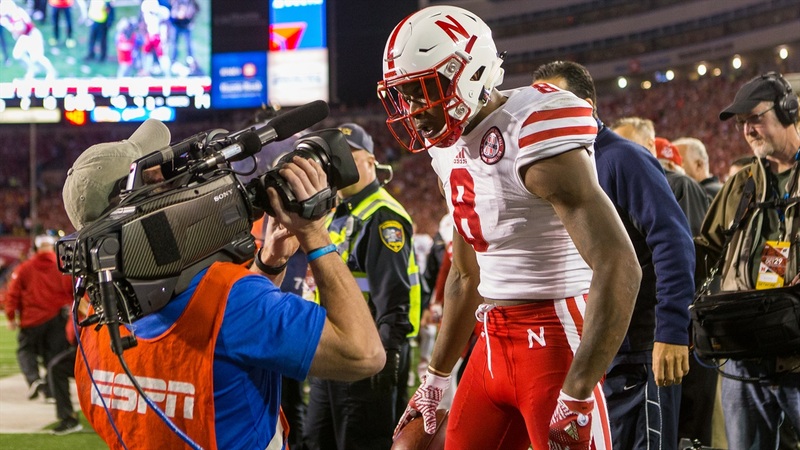 To get a better understanding of what Nebraska is up against with its receiving corps, we’re taking a closer look at both the wide receivers and tight ends ahead of spring football. Replacing Westerkamp, Reilly and Moore won’t be an easy task, but wide receivers coach Keith Williams is up to the challenge with his current roster and his incoming talent. The Huskers brought in Keyshawn Johnson Jr., Tyjon Lindsey and Jaevon McQuitty as scholarship recruits for the 2017 class, as well as preferred walk-ons Dylan Reynolds and Kade Warner. There’s reason to believe Nebraska’s young talent will play a major role in 2017, with athletes like Lindsey, Johnson and McQuitty expected to see the field early in their careers. Add in redshirt freshman JD Spielman and the Huskers have solid support for Pierson-El and Morgan. What’s especially helpful is that Johnson and McQuitty are already at Nebraska, allowing the two to grow within the program over the spring and summer. That will also give both the time to adjust to Nebraska’s quarterback (which is another big question mark at this point). McQuitty seems to have the best shot at seeing the field right away out of the newest wide receiver recruits, as he could play both outside and slot receiver depending on Nebraska’s needs. Speaking of the slot position, keep an eye on Spielman. He is the best bet to replace Westerkamp and will have an opportunity to show off his skills during spring football. Considering he almost played as a true freshman in 2016, Spielman has a lot of potential for the upcoming season. Plus, he was the one to share the offensive scout team MVP award with quarterback Tanner Lee so there’s a good chance that the two have good chemistry already. Nebraska also has Bryan Reimers and Gabe Rahn to lean on depending on needs and both will have a shot to show off their growth this spring. Long story short, the Huskers have plenty of options at wide receiver. How exactly Nebraska utilizes them is the question yet to be answered. Losing Carter hurts. There’s no doubt about that. Filling his shoes will be a big challenge in 2017 with very little experience currently on the roster. The current scholarship tight ends are sophomore Matt Snyder and redshirt freshmen David Engelhaupt and Jack Stoll. The non-scholarship tight ends are seniors Tyler Hoppes and Connor Ketter, alongside redshirt freshman Branden Hohenstein. From that group, the Huskers have seen the most from Ketter but even that’s minimal. As for the 2017 class, Nebraska recruited Kurt Rafdal and Austin Allen who both have quite a bit of a potential. However, both need to put on some more weight for their frames (Rafdal is 6-foot-7 and 230 pounds, while Allen is 6-foot-8 and 230 pounds). Both could benefit from a redshirt season, but that may depend on what comes of the players currently on the roster. Spring football will provide an opportunity to sort through the inexperienced talent at the tight end position. Incoming freshmen will have the chance to make a name quickly but Husker fans won’t get a chance to see that until fall. For now, the tight end position remains a mystery as spring football begins. For a closer look at other position groups, check out our spring football preview on the quarterbacks, linebackers and running backs.